Settled back in New York City following World War II, Steinberg took up an active social life. 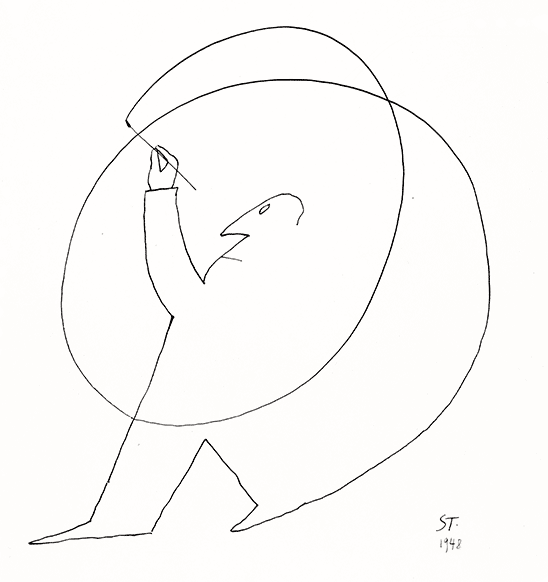 “The Steinberg-Sterne household linked many overlapping circles of acquaintance, including painters…expatriate Italian designers and writers; New Yorker contributors, such as Charles Addams, Geoffrey Hellman, Joseph Mitchell, and S.J. Perelman; and Alexander Calder and his family.” From 1952 to 1958, “the couple’s brownstone on East 71st Street formed the center of a culture all its own at the heart of the intellectual establishment.”9 Steinberg would go on to maintain friendships with major artists and intellectuals of the postwar world—Igor Stravinsky and Alexander Schneider; Vladimir Nabokov, Saul Bellow, Harold Rosenberg, and William Gaddis; José Luis Sert, Marcel Breuer, and Le Corbusier; Henri Cartier-Bresson, Walker Evans, Charles and Ray Eames; Richard Lindner, Philip Guston, Robert Motherwell, Ad Reinhardt, Mark Rothko, and William de Kooning. Such lively companions both reflected and nourished his own many-sided interests and intellect. In the 1940s, Steinberg established his multifaceted career—as a gallery artist, a magazine artist, an advertising artist, a designer of textiles and stage sets, and a muralist (only about a quarter of his output comprises magazine and other commercial work). But his training as an architect was not forgotten. “I began with architecture, and I continued with drawing,” he explained, attributing the precision of his line to architectural drafting.10 “The frightening thought that what you draw may become a building makes for reasoned lines.”11 The renowned economy of Steinberg’s line probably owes something to lessons learned from fellow artists at Bertoldo, among them Giovannino Guareschi and Giovanni Mosca. In later years, he would say that “the cartoonist’s profession is a difficult one, especially because you have to be your own editor: eliminate, eliminate, eliminate.”12 Steinberg’s involvement during his Milan years in two radically different enterprises, architecture and cartooning, engendered his American career.